Then there were three - On the 3rd January SNCF withdrew BB 67330/67338 and 67377leaving just three members of the sub-class remaining in service - BB 67345, 67348 and 67376 for use on the Bourges - Montlucon leg of the Paris - Montlucon Intercite services. With the run down of Nevers depot the three survivors have been transferred to St Pierre des Corps. On 27th December 2017 BB 67348 arrives at Saint Amand Montrond-Orval with the evening train to Paris. Photo D Michel Costes. The head of SNCF, Guillaume Pepy, described some of the plans of the railways group for the New Year during an interview on breakfast TV at the beginning of January. He associated the incidents in December (see separate article) with a lack of investment in the historical rail network that is mostly over 30 years old. 5.2 billion euros is to be invested in maintenance and renewals in 2018. A target is set to improve punctuality to 90% on time. 135 new trains are expected to be delivered during the coming year. Modernisation of stations is in progress notably at Paris Gare du Nord, Austerlitz, Lyon Part Dieu, Nantes, and Rennes. Ticket barriers are being installed (for the first time at Gare St Lazare) to combat fraud. A programme is underway to introduce more low cost OUiGO trains. The number should double during 2018 and it is expected that some of the new services will use central Paris termini at Montparnasse, Gare de l'Est and Gare de Lyon for the first time. In recent months we have focussed on the decline of CC 72100 and BB 67300-400 diesels, but there has also been a steady decline in the use of Class BB 7200 on long distance TER services in South West France. They are still employed in the area on Intercite duties operating Bordeaux - Marseille, Toulouse Bayonne and some Paris - Toulouse services. December saw further re-branding of SNCF services with 'Oui', the Voyages-sncf internet booking website being re-branded as Oui.sncf. Regular internet customers were sent an email with a link to a video explaining the change; travelling by SNCF enabled you to say 'Oui' to all the things you wanted in life from smiles, hugs and meeting up with family to snow, ski-ing and the sea. Unfortunately a number of high profile incidents in the run up to Christmas soon had commentators suggesting it should be 'Non' rather than 'Oui'. First, all of the information screens at Montparnasse failed for a whole day, followed by the failure of a forty year old transformer near St Lazare, with all movements stopped for three hours followed by disruption from rolling stock diagrams being displaced. On the Friday before the Christmas week end, school holidays started and chaos occurred at Paris Bercy for access to the intercités and TER to Dijon, Lyon, Nevers and Clermont-Ferrand. Unlike the TGV services that were fully booked, these are not subject to compulsory reservation and the tickets sold far exceeded the capacity of the trains. About 2,000 travellers were affected and all 5 train sets in reserve were rushed into service during the day. Finally, at the end of the afternoon, SNCF laid on a double duplex TGV from Gare de Lyon to Dijon and then all stations to Lyon. OnThursday, Dec 21st, the weekly sleeper to Moscow with 80 passengers on board left Paris-Est as usual at 18.58. It broke down at La Ferté-sous-Jouarre and was dragged back to Gare de l'Est where it stayed overnight. It departed again the next morning, but on arrival at Strasbourg there was no DB locomotive to take the train forward. After spending 24 hours at Strasbourg, while SNCF and DB communicated, the train finally crossed the Rhine and headed towards Russia, on the Saturday morning, 40 hours late. All high speed lines in France are checked daily for conformity by an empty TGV before commercial services start. From the beginning of 2018, the new Tours - Bordeaux high speed line line (SEA = Sud Europe Atlantique) will be "swept" each morning at 160 kph by a new inspection railcar, diesel powered, designated BROOM (Bimoteur Rapide d'Observation et d'Ouverture par la Maintenance). Two vehicles have been built by SOCOFER at Tours. Photographed by Georges Turpin at Montauban on December 5th 2017. SNCF has placed an order for 32 Bombardier Regio 2N double deck units to replace corail hauled stock on the Intercite services from Paris to Nevers, Bourges, Orleans and Tours. Responsibility for the services will transfer to Centre Val de Loire TER. The new units are similar to the 40 ordered for services from St Lazare to Normandie. Each eight coach unit has a top speed of 200km/h and 373 seats. Up to three units can operate together. Deliver will be between 2020-2022. Two branch lines in Picardie will close May 18th, one will re-open at the end of 2019. The Beauvais - Abancourt - Le Tréport line will close for renewal of track and modernisation of signalling. This means removal of the old Lartigue mechanical signals, the last in France. Re-opening is scheduled for December 2019. Also in mid May, the Abbeville - Le Tréport branch will close possibly permanently as there are no plans for modernisation. For many years, this line has been used by just two return services daily with some additional services at summer weekends. 2018 will be the 80th anniversary of SNCF (1938 - 2018) and the company has opened an on-line store that sells objects inscribed with the old logos (mugs, lunch boxes), framed posters, notebooks, bags, badges etc. The link is here: magasingrandtrain.sncf.com. Delivery world wide. From January 1st 2018, Occitanie Region took over responsibility for the Ligne des Cevennes. This line from Clermont-Ferrand to Nîmes carries 3 trains a day each way of which the afternoon service is the "Cevenol" ex-intercité. 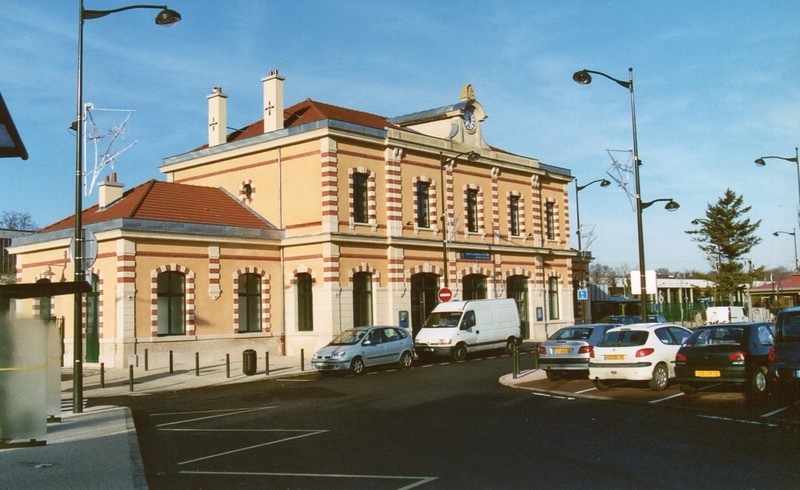 There are several other services between Mende and Nîmes. All these trains are operated with X 73500 and AGC railcars. Three Coradia Liner trains are on order for use on the Cevenol service probably by the end of 2018. Occitanie is currently negotiating with SNCF a new convention with the conditions relative to the operation of the TER rail services. The Region has indicated that it will insist that the Cevennes line be kept open in good conditions. They are likely to include penalties for trains cancelled or late. SNCF has tried for many years to close the Cevennes line by providing an unreliable service, turning stations into unmanned halts, making it impossible to obtain tickets (thus understating usage of the line) and reducing line speeds even after engineering work. On Dec 23rd the Vie du Rail shop at Gare St Lazare closed down and a new shop has opened 29 rue de Clichy opposite the Casino de Paris variety theatre. The new boutique is about 6 - 7 minutes walk from Gare Saint Lazare. It opened January 8th 2018, from Mondays - Fridays, but not during the week end. More space and the usual wide selection of books, DVD's, magazines about French railways. 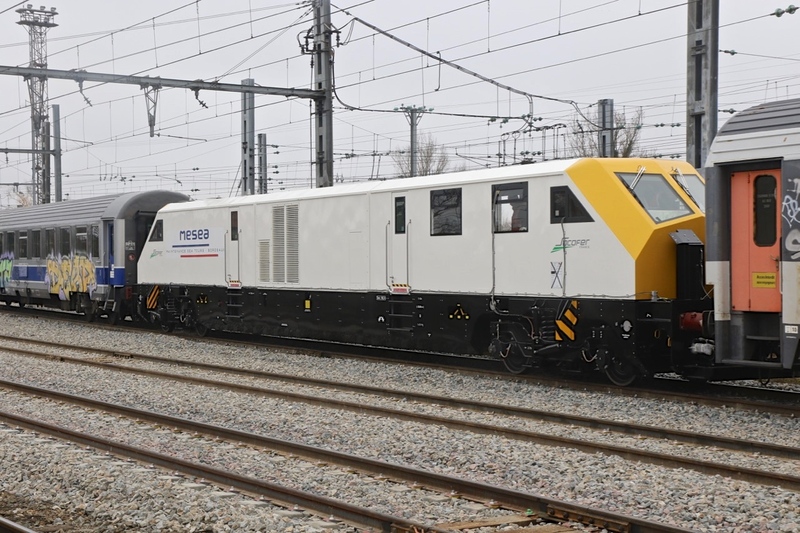 Alstom have received orders for a further 14 Coradias. Bourgogne Franche Comte TER have ordered a further eight Class Regiolis Z51500 four coach electric units, in addition to the 16 units currently in the process of being delivered. 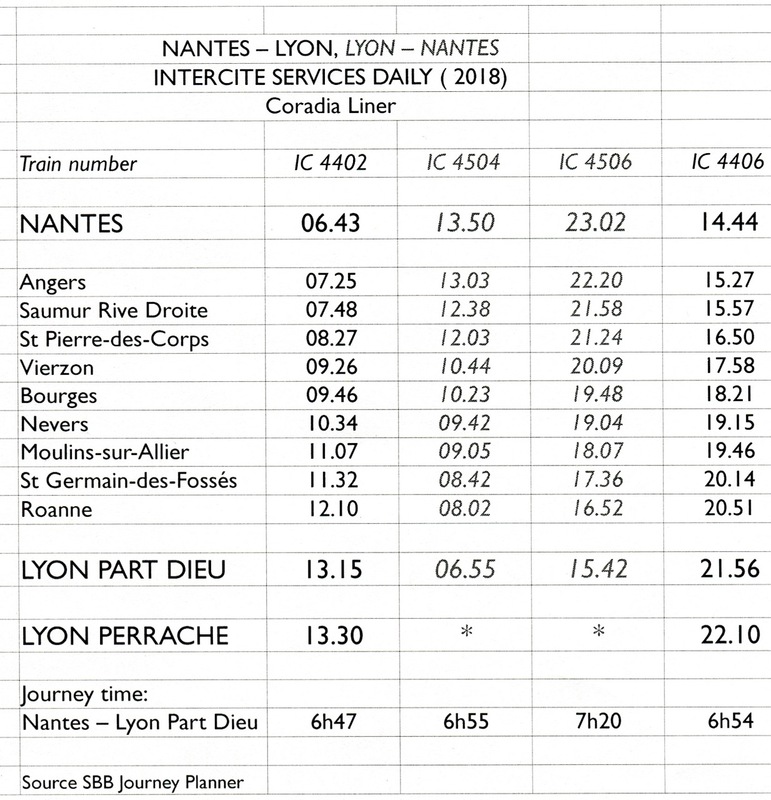 The allocation of Alstom Coradia Liners to Nantes Depot has seen the re-introduction of through Nantes - Lyon services. Latterly these have operated only at weekends. Over the years RTGs, Class CC72000 and BB 67400 have operated the service. Two services a day each way now operate, the timings are shown below. 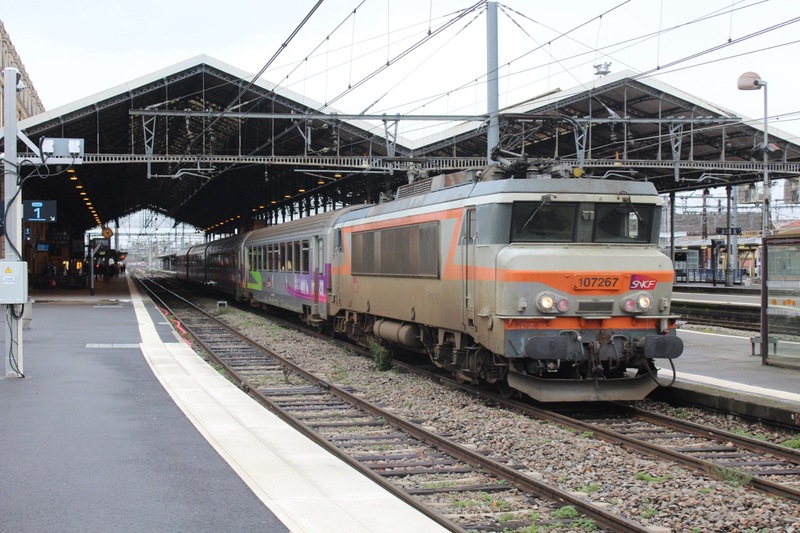 Since September 2017, the overnight train between Rodez and Paris-Austerlitz was diverted via Bordeaux (Mons - Fris) due to engineering work on the POLT. However since mid-November the Rodez sleeper has been suspended except at week ends when it runs normally via Limoges. This is because during the week there is now overnight engineering work between Brive and Bordeaux until May 2018. In the December News we reported on the new improved timetable planned for Line 4. Sadly it has yet to come to fruition. In mid January, train services on Line 4 continued to be disrupted with only 2 of the 5 scheduled long distance trains (Paris Est - Mulhouse) being operated and many cancelations of Paris Est - Troyes services. Initially these difficulties were attributed to local strikes. Currently these strikes are ending but it is now reported that the principal problem is the non-availability of the new Coradia Liner train sets. There is a fleet of 19 units. The new Line 4 timetable was designed to use 17 units with 2 in reserve/maintenance. However 6 Coradia Liners are out of service due to collisions with trees, an animal and a level crossing incident. They are awaiting spare parts. 4 Coradia Liners have been assigned to TER Val de Marne services. Hence the production difficulties on Line 4 where, in compensation, the new trains sets are being used more intensively than planned creating maintenance problems. SNCF have announced that they are building a new depot at Amiens, in one of the now disused freight yards at Longeau. The purpose built facility will be designed to cater for the AGCs, Alstom Regiolis and Coradia Liners that are on order for Boulogne - Amiens - Paris services. Maintenance currently undertaken on AGCs and Regiolis units at Le Landy will be transferred, taking pressure off the Paris depot. The delivery of the Alstom Coradia Liners will bring to an end Longeau's once large fleet of Class 67400s. A reduced maintenance facility will be retained at Longeau for diesel freight locomotives. The single track branch line has been closed from Jan 2nd until March 25th for reconstruction of 12 km of track, a second tranche after 10 km renewed in 2017. Platforms will be reconstructed at 5 stations and 2 small bridges will be replaced. The total cost will be 12.5 million euros. The section in the upper valley from Limoux - Quillan (28 km) also needs renewal but currently there is no budget for that and there are rumours that this section will not re-open at the end of March. This line of 70 km was closed for passengers in 1970 but remained open for freight until July 2015 when the state of the track prevented further operations. In order to serve the silos along the line a "light" renewal is in progress that will allow freight trains to run for the next 15 years. For a cost of 6.45 million euros partial replacement of sleepers and the addition of new ballast along 50 km will be provided during the first half of 2018. It is expected that a private operator will subsequently maintain the track and organise the transport of cereals. The special week end ski train (Brive - Aurillac - Le Lioran) with X 2800 railcars on 2nd February 2001 It descended to Neussargues to park during the day. Shortage of SNCF drivers to act as pilotman caused problems last year, particularly for some of the Autorail tours and empty stock/light engine movements. The fragility of mainline steam preservation was highlighted by the position of 141 R 1199 at Nantes. The dispute between Loco Vapeur 1199 and SNCF in 2016 resulted in the operating agreement being cancelled just as a major overhaul was being completed. The Association's rake of preserved coaches was heavily vandalised when moved to an insecure siding and many have now been cut up. The future of 141 R 1199 is unclear, rumours that it will go to PVC at Sotteville appear unfounded and it may well become a static exhibit at Mulhouse. Overall a tragedy for preservation given that the coaches had been recently restored and repainted and the locomotive was approaching mainline certification. The events at Nantes highlight the challenges facing mainline preservation generally. Maintenance of modern rolling stock and locomotives is increasingly being conducted by the manufacturers, often in facilities purpose built for specific trains. As a result traditional depots built around heavy engineering with lifting gear, wheel drops and examination facilities etc., are closing, providing fewer facilities for preserved locomotives and rolling stock. Surplus or marginal land and covered accommodation used to house preserved stock is being sold off. The decline in facilities will see a decline in skills, but SNCF also need to retain the capacity to examine and supervise preserved rolling stock if it is to operate on the national network. Currently being restored by AJECTA. New boiler returned from Italy after repairs following errors discovered in work done by a contracter in Poland. Operates on CFTV (Chemin de Fer Tourisitique Vermandois). Main-line certification reported to be still an objective (probably medium term). One of AJECTA's two operational locomotives but currently under repair. The AJECTA programme for 2018 does not appear to include any steam tours. Operated the Vapeur du Trieux in 2017, and arrived at the 11th hour to operate the AJECTA Santa Specials. Expected to operate the Vapeur du Trieux between Pontrieux and Paimpol in 2018. One of CFTLP's two steam locomotives. Axle repairs largely complete. Probably no hurry to return to service while 140 C 38 is operating. A lengthy overhaul was largely complete when problems were detected with the firebox stays. These are currently being worked on with the boiler in-situ. Hopefully the work will be complete by the summer. Overhaul completed during 2017. Coupling rod bearing ran hot during loaded test run in November , but expected to be operational in 2018. A major overhaul was largely complete when operators Loco Vapeur 1199 entered into a dispute with SNCF and their operationg agreement was cancelled. The future of the locomotive is now uncertain. Currently being restored by APPMF association at Gièvres, Sologne. Boiler under repair in Italy. Monthly reports on Facebook page. A long term restoration project by AAATV-SPDC. Recently reported that the boiler and frames had been separated. Operated a successful programme of tours in 2017. The first tour in 2018 will be from Paris-Nord to Arras on May 26th. 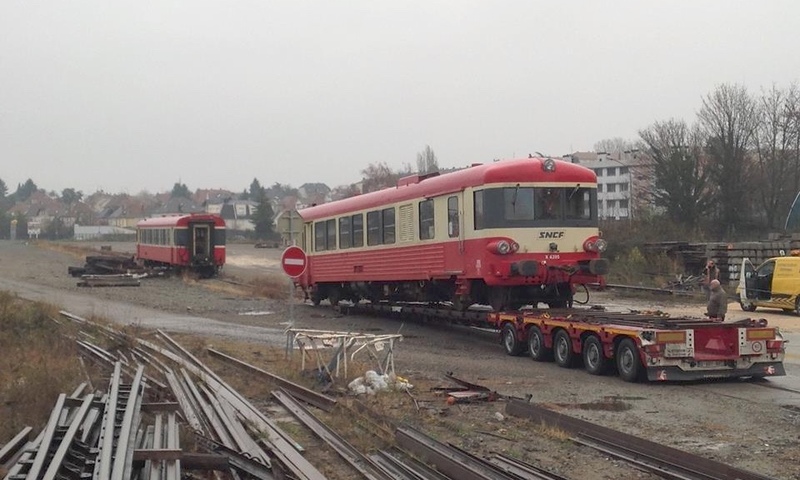 After 10 years of mainline tours TTDA (Train Thur Doller Alsace) have decided to transfer their preserved Caravelle X4395 to Cernay to provide it with secure accommodation. In recent years the autorail has been subject to a burglary, squatters and tagged ten times by vandals. on 105 days travelling 35,000 kilometres and visiting numerous destinations including Vallorbe, Le Treport, Montlucon and St Gervais - Mont Blanc. In December it suffered an engine failure approaching Mulhouse when returning from the Basle Christmas Market. In France, the term "tram-train" is used for a growing number of lines that we would categorise as "Light Rail". The tram-train vehicle is designed to operate on both standard-gauge railways and tramways. The first tram-trains in France were Siemens Avanto units that are used on the Aulnay - Bondy line (Tram 4) in the eastern suburbs of Paris and at Mulhouse between Thann and the central station via the urban tramway. 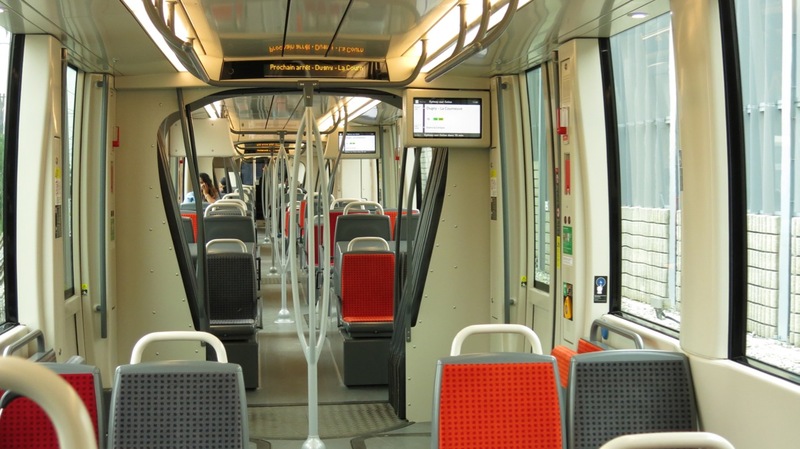 All the other light rail lines in France are now operated with Dualis sets (Nantes, Lyon, Ile-de-France) constructed by French multinational Alstom. Ironically, Siemens and Alstom are set to merge during the next two years. 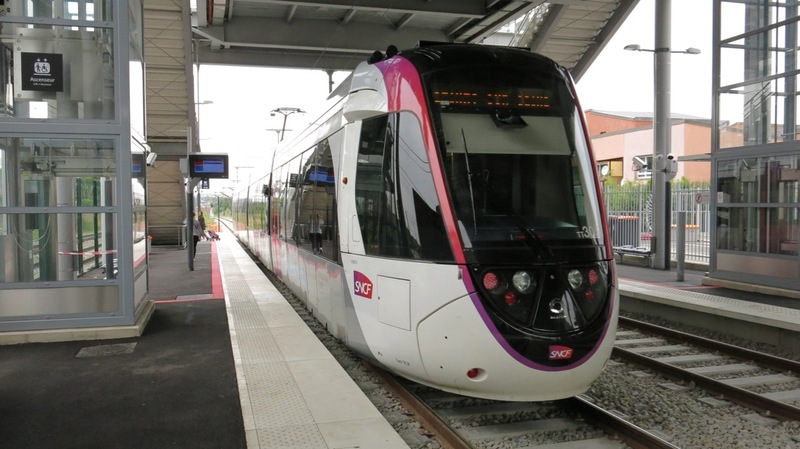 This article describes four light rail projects in Ile-de-France that are partly in service and/or under construction. They are intended to provide new cross suburban rail transport links to relieve road congestion. These lines are now designated "Tram Express". SNCF is the designated operator of all these "tram-train" lines. Three of these planned lines will use the Grande Ceinture infrastructure ( an orbital rail route around Paris that interconnects the radial main lines from Parisien termini. Creation of GC was started in 1875). This line will connect Saint-Cyr l'Ecole(near Versailles) with Poissy / Achères via Saint-Germain- en-Laye. The project is planned in two stages. Stage 1 is under construction. It will absorb Grande Ceinture Ouest (GCO), a 9 km conventional railway, electrified at 25 Kv between Noisy-le-Roi (photo opposite) and Saint-Germain Grande Ceinture. This double track line with 6 stations is operated with 3 Z 6400 units and it is connected at Saint-Nom-la-Breteche with the Transilien network Line L.
GCO was opened in December 2004 and traffic was forecast to be 10,000 passengers a day, but it has never exceeded 2,000 a day due to the absence of connections or population centres at each end. During stage 1 of the new project, the GCO will be extended south from Noisy-le-Roi to Saint-Cyr l'Ecole where a 900 m branch will be created to reach the RER station for connections to suburban lines C, N, U. The maintenance depot will be constructed 1km away at Versailles Matelots. All the new track south of Noisy-le-Roi will be constructed (like the GCO) to the standards of a mainline railway apt to carry heavy freight trains, though none is planned at present. So not really light rail infrastructure(! ), especially as BAL signals(*) will apply to the tram-trains. At Saint-Germain GC, (see photo below) a junction will be created and a 3.6km tram line (electrified at 750 volts) will be built through the forest to a terminus near the Chateau of Saint-Germain-en-Laye. A pedestrian tunnel of 200 metres will be constructed from the tram terminus to the RER A terminus. Two travelators of 100m will be installed in the tunnel. Future low level platforms at the 9 intermediate stops will contain all the necessary equipment for passengers (ticket automat, shelter). Consequently, any historical "Batiments Voyageurs" along the GCO will no longer be used and will need a different function (notably at Noisy-le-Roi and Saint Germain GC). Existing platforms will have to be lowered and shortened by installing vegetation on the parts not used. The journey between Saint-Cyr RER and Saint-Germain RER will take 30 mins with a tram-train every 10 mins at peak and 30 mins off peak and week ends. Passenger numbers are forecast at 21,000 daily with the connections to RER A, C and Transilien L, N, U. Stage 1 is expected to open in 2020. Stage 2 is still being planned. It will be a tramway mode extension from Saint Germain GC through the forest to Poissy and then Achères. It will most probably be completed around 2025. This short, isolated, light rail line was opened in July 2017 and was described on News Pages June and August 2017. 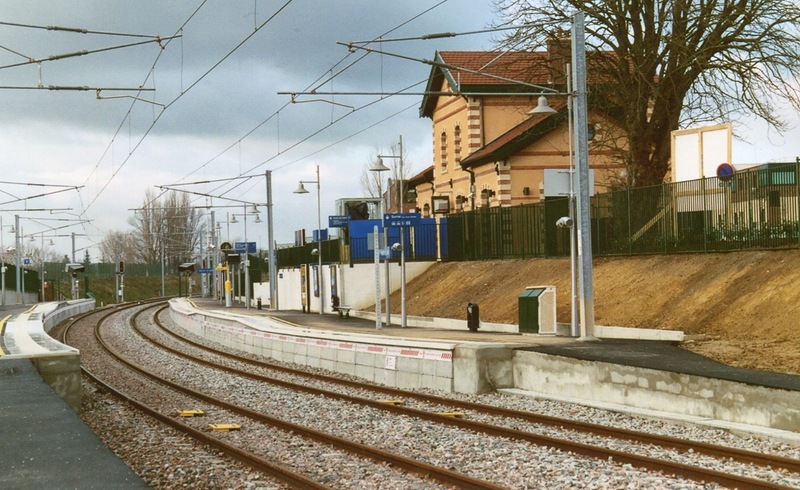 The new line was constructed parallel to the Grande Ceinture Nord tracks between Le Bourget (RER B, D) and Epinay-sur-Seine (RER C). The journey time is 15 minutes with 5 intermediate stops. 15 Dualis tram-train units are used. They are maintained at a new depot near Bobigny and the Dualis units travel there via a connection to the Grande Ceinture tracks at Le Bourget. Tram Express 11 is the central section of a planned arc 28 km long that will stretch from Sartrouville in the west to Noisy-le-Sec in the east. Opening dates for these long term projects are "pencilled in"; 2024 for the eastern extension and 2027 for the western extension. This short 8km line is operated by SNCF from Aulnay-sous-Bois(RER B) to Bondy(RER E) in the eastern suburbs of Paris. It was opened in November 2006, the first of its kind in France. Now known as Tram 4, it was created from an SNCF branch line. It is electrified at 25 kV 50 Hz. but, otherwise, the characteristics are those of a tramway with low platforms, no signals, and road crossings controlled by traffic lights. There is a fleet of 15 Siemens Avanto tram-train bi-voltage units. The traffic is 37,000 passengers daily, compared with a forecast of 40,000. Opposite A T4 Siemens Avanto heads towards Bondy. T 4 has not received the designation "Express" like the other lines. Dating from 2003, the project is to create a tramway branch from Gargan (half way along Tram 4) to Montfermeil, a remote dormitory suburb poorly served by public transport. Some local opposition delayed the timely development of this project. It has moved forward slowly following approval in 2013. The 6.5 km branch is now under construction along the roads as an urban tramway electrified at 750 v DC with overhead wires. Since the original Tram 4 line is electrified at 25 kV, several complications arise now for rolling stock and infrastructure. A junction with the tramway branch will be created at Gargan and the 750 v. overhead wires from the branch will be extended into the Gargan station area. Tram-trains to and from Aulnay will have to switch voltage momentarily to pass Gargan, an obstacle that could have been avoided by electrifying Aulnay - Blondy at 750 volts from the beginning. Obviously other considerations, of which we are not aware, prevailed at that time. From the summer of 2018, the fleet of Avanto tram-trains will be withdrawn for general overhaul and modifications to activate their 750 v DC systems that will be needed to cross the station area at Gargan. The new Dualis units will replace the Avanto's from the summer of 2018 for approximately 12 months. The twin branch Tram 4 line is scheduled to open at the end of 2019. This is an ambitious new light rail project between Evry and Versailles. It will include a new tramway of 10km and tram-train operations along the Grande Ceinture Sud. Construction has started, but completion is currently forecast to be delayed until 2021-2022. The project will be described in detail in MARCH NEWS. © Peter Lovell & Graham Skinner. The French Railways Society 2018. Thanks to Georges Turpin (Occitaine reports), Patrick Bennett, D Michel Costes, Jean-Louis Poggi, Didier Delattre, Raphael Renaud, Kévin Lesieur and Sylvère Zanaroli. Photos by authors unless credited.